I've been having a lot of fun compiling unique gift guides to share during DIY December this month and have come across some pretty quirky gifts. If you missed the first post, check out my unique hostess gift ideas. Today, I'm sharing some creative gift ideas for the fun loving cook in your life. 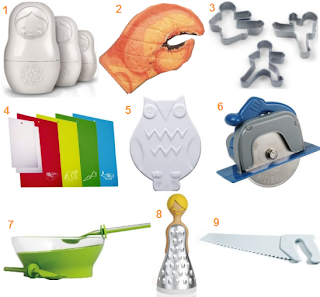 Have you come across any great gift ideas for people who love to cook or bake? These are so fun! I love the lobster mitt and the pretty green bow!